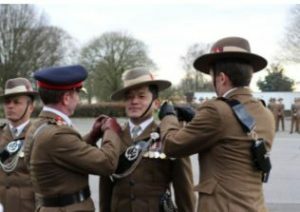 The Queens’s Gurkha Signals Like every year, in the chilly month of 2nd February 2018, 45 young Gurkha soldiers who arrived in Bramcote after their tough infantry training in Catterick were all ready to take their oath to serve QG Signals with their utmost commitment and loyalty. The parade took place at Gamecock Barracks, the home of the Regiment in the presence of Brigadier N M Stokoe OBE who was the reviewing Officer. Along with the 45 new Trainees, Officers, Soldiers, Veterans, families and friends gathered together to witness the event at 1430hrs in the Parade Square. Prior to that a Regimental lunch was held at 1230hrs in the gym. 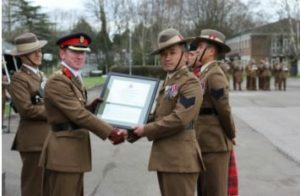 The whole event was conducted under the instruction of Captain Shankar Gurung, who was the parade commander. The proudly presented new trainees were first inspected by the reviewing officer, and then marched off in threes to halt in front of the QG Signals flag and took an oath to serve the Regiment with uttermost pride and dedication as well as be loyal and faithful to “Her Majesty the Queen and to the Regiment”. Whilst the recruits were taking their oaths, the Pandit recited his mantras in the background. In addition, the excellent melodious tunes of pipes and drums was also played, adding to the upbeat spirit of the event. When the oath taking ceremony was concluded, it was time to present Long Service & Good Conduct medals to Sergeant Gopal Gurung and Corporal Sunil Gurung, followed by the Joint Commander’s Commendation to Sergeant Anand Limbu. The other act of the parade was to formally commission the three newly commissioned officers into the Regiment; Captain Simbahadur Chochangi, Captain Indrabahdur Thapa and Captain Gyanendra Rai respectively. Immediately after the commissioning ceremony, Brigadier Stokoe conveyed his inspirational speech and welcomed all 45 new trainees to the Regiment and congratulated all the commissioned officers and medal recipients. He then took the salute as the parade marched pass in column of route which brought the parade to the end. Soon after this a group photograph was taken and Commander QG Signals, Lieutenant Colonel Fayers announced the trade allocation to the trainees. 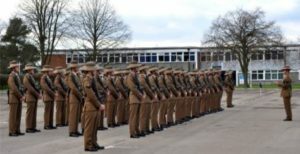 The trainees will now head off to the Defence School of Communications and Information Systems, Blandford, for their respective trade course where they will receive their trade training to fully craft and nurture their skills and get posted to one of the Gurkha Signals Squadrons.